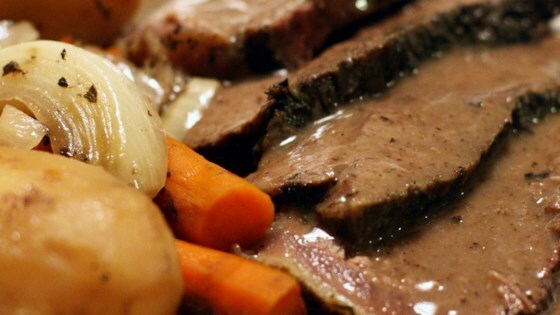 "I call this my 'famous Seamus' pot roast because my tiny Siamese cat, Seamus, sat in the kitchen the entire time this pot roast was cooking. I've been making this recipe for 40+ years and I just throw the ingredients together; it's very forgiving. My son-in-law also says it's the best thing he ever ate. When boys hang around the oven, it can't be bad." Sprinkle the roast evenly with the flour and set aside. Heat the canola oil in an oven-proof Dutch oven with lid over medium-high heat. Brown the roast on all sides, about 10 minutes total; remove from the heat. Pour in the water and wine. Sprinkle with the basil, marjoram, thyme, salt, and pepper. Arrange the onion slices on the roast. Replace the cover and bake in the preheated oven for 3 hours. Add the potatoes, carrots, and pearl onions. Pour in additional water if the roast looks dry. Continue baking covered until the roast pulls apart easily with a fork, about 1 hour longer.